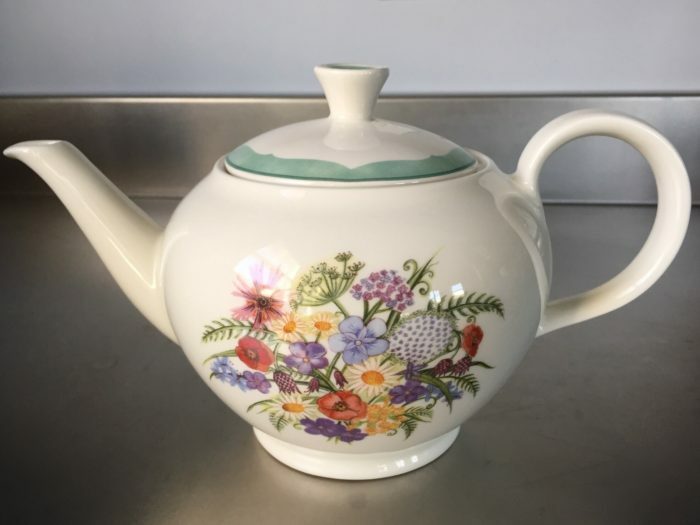 This teapot is called “Coronation Meadows” and is made for nature lovers and tea lovers everywhere. Burleigh Pottery made this pattern for Highgrove, the country estate of HRH The Prince of Wales. The Coronation Meadows design was inspired by an effort in the U.K. lead by Prince Charles to ensure there is a wildflower meadow in all 107 counties. The U.K. has lost 97% of its wildflower meadows since 1930. In addition to establishing new meadows they intend to document all remaining meadows in order to preserve existing wildlife habitats. Click here for more information on the Coronation Meadows Initiative. This teapot is even more special because it’s from my sister. I like to pull it out and use it in the spring when all the wildflowers are waking up. It’s perfectly suited for a rose scented black tea or a jasmine green tea.